This is a modern apartment located right in the heart of Barcelona. It can be found in the Gothic Quarter of the Catalan capital, close to Las Ramblas. The apartment can sleep up to four people. It has one bedroom and parquet flooring throughout. The living room has a comfortable double sofa bed, a TV with satellite, and access to the balcony. The kitchen is fully equipped and has all of the utensils and appliances you would need to prepare your home-cooked meals. The bedroom is bright and has two single beds. The bathroom is also modern and has a walk-in shower. 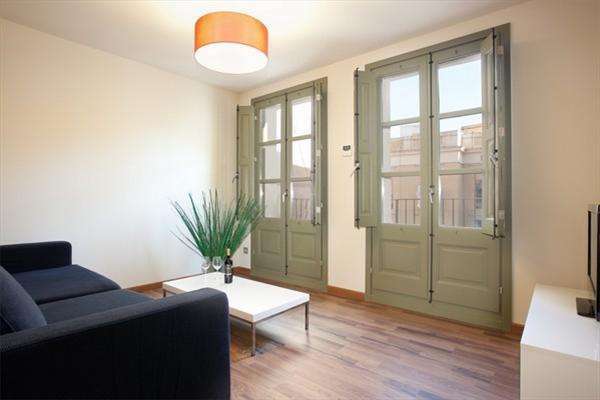 Located in the centre of Barcelona, this gorgeous apartment has both heaters and air-conditioning making it comfortable all year round!